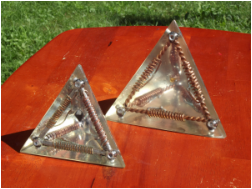 These three-sided pyramids have active coils along each of their vertex lines, creating a specific flow of energy inside that accumulate and pulses constantly creating an active field around the pyramid. After studying the subject of geopathic lines and how they affect peoples’ health, I wanted a way to deal with geopathic lines that did not involve blocking or deflecting them; otherwise they become someone else’s problem down the road. 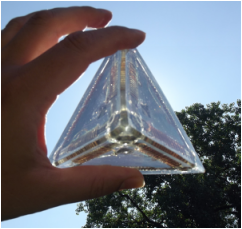 Enlisting the help of a professional dowser in order to do tests, experiments showed that placing one of these pyramids on a geopathic line makes all lines disappear in a 30 foot radius, upstream and downstream of the location of the pyramid. My dowser friend was confused and surprised and asked with his pendulum what was happening; after several minutes he determined the lines were being transmuted into a higher dimensional plane, upwards of fifth dimension. He suggested that placing one at each corner of a house would protect the entire house.